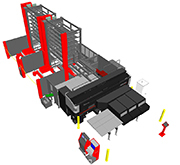 Debut of machine combining fiber laser and punch! 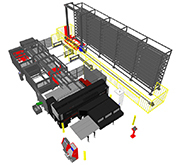 Highly efficient process integration achieved with less energy consumption and cost! The laser cutting area is enclosed by a table cabin and a shutter to provide laser light shielding. The machine can be easily combined with peripheral units and automated to achieve a shorter total lead time. The need for a laser oscillator gas is obviated to achieve energy savings. 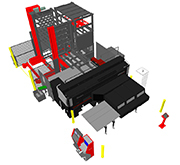 The fiber laser can clean-cut thin materials with higher speed and lower cost than the 4 kW CO2 laser. The laser moves along the Y-axis. During laser cutting, the material moves only along the X-axis. The processing area is enclosed with the table cabin and shutter to shield the laser light completely. The second origin can be set to set the material without opening and closing the table cabin. A maximum of four types of tapping tools can be mounted to reduce the tapping operations. ID Tool system are always maintained in their best condition to stabilize processing quality. A destacker in the storage tower allows for flexible process scheduling regardless of material types and thicknesses. The two-storage tower specification, composed of a material storage tower and a part and skeleton storage tower, allows the continuous processing of multiple materials and parts at the same time. The LC-2515C1AJ can be connected with an automated storage and retrieval system to achieve long continuous operation. The overall system can be laid out to suit the available floor space and height of specific customers. For any inquires, please contact local AMADA branch office. © AMADA CO., LTD. All Rights Reserved.